We r lucky to get an upgrade to the upper floor corner suite and the view is really amazing. I guess it is probably the highest point in akrotiri already. However, the road to come up is a bit narrow and tricky, but it is still possible with a standard 4 seater car, just drive slowly. Highly recommend this place. I had a girls relaxing vacation summer 2015. It was our first time in Santorini and by far this place was amazing!! We ran into a little problem when we first got to the hotel. Our flight got in late and we took a taxi over. We didn’t know the roads were too narrow for the taxi to go through, so they left us way down the hill and told us to walk in. Well, it was dark and we were not sure how far up the hill the hotel was. There were 3 of us girls, so I took 1 for the team and headed up the hill by myself praying that I find the right place. Finally when I got to the hotel, Samson the host help me out. He hopped into his vehicle and made his way down the hill to pick up the girls.. He told me I should have called him from down the hill and that they would have sent someone down to get us. Which I didn’t know. Besides that the hotel was Magnificent!!! Staff Samson & Leftie were very nice and helpful with everything. The view, the food, the staff perfect. The island is breathtaking. You need a vehicle to get around the Island since everything is far from the hotel. Santorini has lots of steps and it requires a lot of exercise. Bring good comfortable shoes because you will need it. Best trip ever. 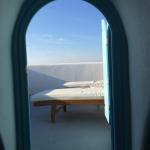 I would recommend this Hotel to anyone who will be visiting Santorini. Make sure that you contact the hotel when you get drop off by the taxi driver. Room tip: Call the hotel for pickup when taxi drops you off. There were three elements that made this hotel so appealing that I decided to book it: simple, traditional architectural design, seclusion and magnificent views of caldera. And when were arrived at the hotel it exceeded our expectations. 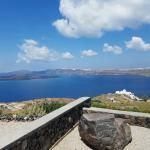 We stayed at the last villa in a duplex and two terraces that were offering unobscured views of the surroundings - especially spectacular during early morning breakfast when the sun doesn't overshadow Thira and Oia seen in the distance. Notabene, breakfast can be served at the outdoor restaurant or it can be delivered to your room. 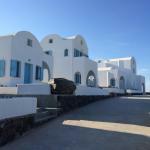 The entire place is extremely clean, service is excellent, everyone working on the premises is super nice and extremely accommodating.There a few restaurants nearby in Akrotiri, 2 or 3 little grocery stores and a few beaches with kayaking options. The only downside is a complete lack of clear signs leading to the hotel, which made me waste almost 2 hours before I was forced to call the hotel risking an enormous bill for rooming to have someone meet me in Akrotiri and finally guide me to the hotel. So placing clear signs in order to spare aggravation to their clients would be a wise idea. Other than that - Heaven on Earth! 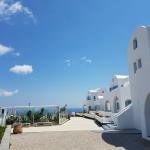 If you are searching for a stylish, relaxing, comfortable, friendly place to stay in Santorini, I cannot recommend Kalestesia Suites highly enough. Kalestesia Suites are perfect for couples who want a relaxing break so iIf you want to be in the centre of the action this is not the place for you, although the main centres of Fira, Oia or Kamari can be reached easily by car or bus. 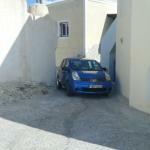 The centre of Akrotiri, with its few retaurants, is within a twenty minute walk down a steep hill. I cannot praise the staff highly enough, they are very friendly and helpful. In fact one morning whilst having breakfast ( which was excellent and filling) a tourist arrived explaining to Leftie, the waiter (terrific bloke), he was lost and asking for directions. After trying to explain how to get to his destination for 5 minutes with little success,Leftie jumped into his car for the tourist to follow to his destination. I must add Leftie did not abandon his guests. 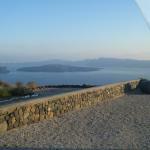 The restaurant and pool areas are very attractive with terrific views. There is also a small gym for those who find relaxing difficult. The hotel arranged a cab for us to get to the airport. We had a late flight in. The restaurant food is excellent. It is a long walk downhill to the bus stop, but well worth the walk to take a bus for 5 euros into the two cities. The manager was very helpful in giving us suggestions on where to eat and what sights to see. Room tip: Upper floors for better view. Booked this after reading other reviews. Exceeded all expectations. The views are spectacular. 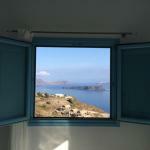 The room we stayed in was beautiful: so clean, excellent fittings with a view over the caldera from one balcony and the other side of the island from the roof balcony. Cannot fault the swimming pool and restaurant and Samson and his staff are amazing and so helpful. You can have the delicious breakfast brought to your room. If you walk out over the shrub land at back of hotel, you can find the perfect spot to watch the sunset without all the crowds at the usual places. There are great restaurants on the nearby road to the lighthouse and down at Red Beach - a five minute drive away. Would recommend you hire a car, a small one as road up to hotel is very narrow in parts (bit scary at first but after a few times, you'll be driving it like a local), and it is so easy to explore the island by car. 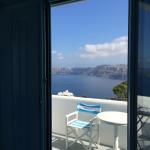 If you want the noise, crowds and nightlife of Oia or Thira then this is not the place for you. 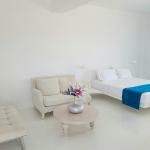 But if you want a truly romantic, stunning and unforgettable place, you won't find better.